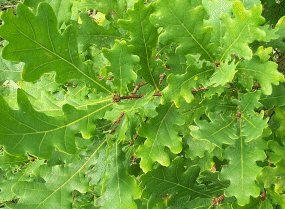 OAK, ENGLISH or COMMON (Quercus robur) (Pedunculate Oak). Hedging Plants, Trees, Shrubs and Conifers. Hardy, slow growing, eventually forming a large round-headed native deciduous tree with acorns on long stems in autumn. Good in hedgerows as it usually produces tap roots in early life, so it does not rob the surrounding plants of moisture and nutrients. Although it produces a broad crown, it does not prevent the hedge from growing well in its shade. Will become home to a copious number of insects and species of wildlife. Very long-lived, up to 200 years. Any ordinary well drained soil, tolerant of clay, produces best quality timber on heavy soil. TREE 15ft x 8ft (4.6m x 2.4m) in 20 years, ultimate height 100ft (30m).